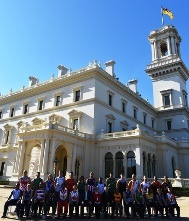 A bright early start saw the nations start arriving outside the gates of Government House from around 8.30am. Some were more punctual than others. In a myriad of team colours, the buzz grew as the time to head in through the gates. Some started to sing, South Africa as usual sounding the sweetest, but others gave it a shot. 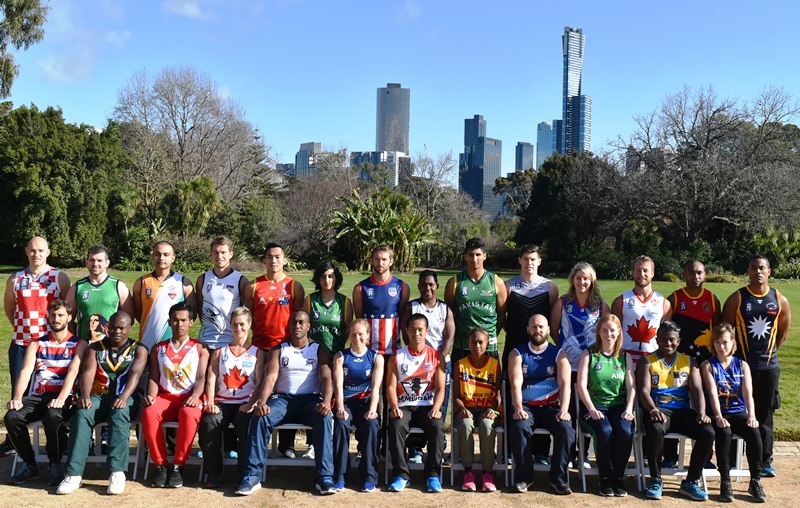 The new nations were there too looking like nervous schoolkids. Germany, European Crusaders and Sri Lanka all stepping out on the footy world stage in Melbourne for the first time. The GB Swans and Pakistani women new too, but had their experienced men's teams on hand to give confidence. Great Britain Bulldogs had an early morning training session that saw some of their players dashing in as the teams marched through the gates. And where was Croatia? Well they would get there, eventually. 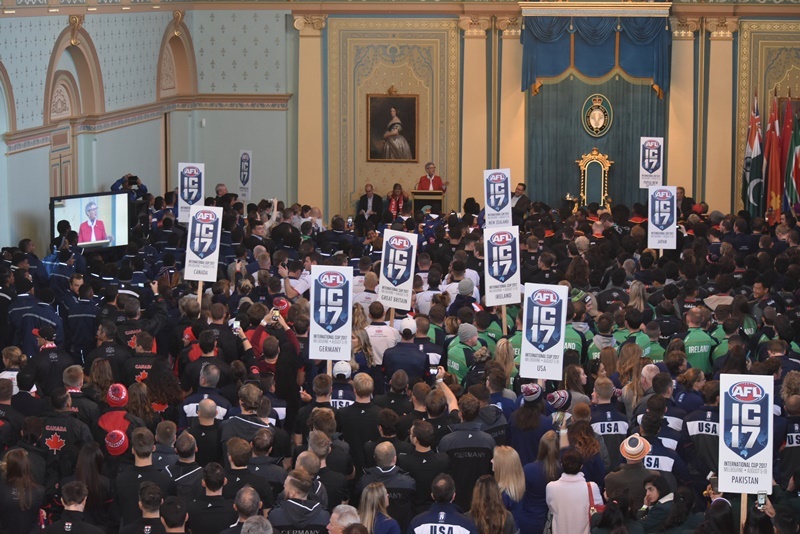 With placards proudly held high each nation paraded as a group through the gates, up the driveway, up the steps and into the historic Ballroom at Government House. The room contained all the teams (probably close to 1000 people all up) and mingling, selfies, old acquaitances renewed and new greetings were exchanged. Outside the captains were photographed. First the 18 men, then the 8 women and then all together. Following this the Honourable Linda Dessau AC, Governor of Victoria,Linda Dessau and her husband Tony Howard and Victorian Minister for Sport John Eren also sat with the captains for photos. 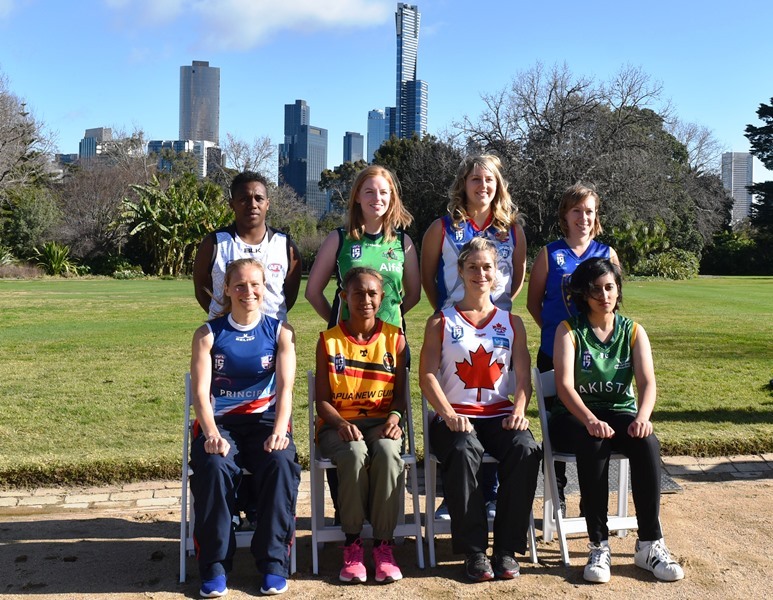 Back inside the 2017 AFL International Cup was launched by the was launched by the Governor and she showed her experience and personal knowledge of the International Cup and all it entails, including the French 'paquito'. Canada Northern Lights captain Aimee Legault spoke elegantly and finished with a 'merci' responding on behalf of the players. Time for group shot and then tea, sandwiches and canapés before heading off to the MCG.